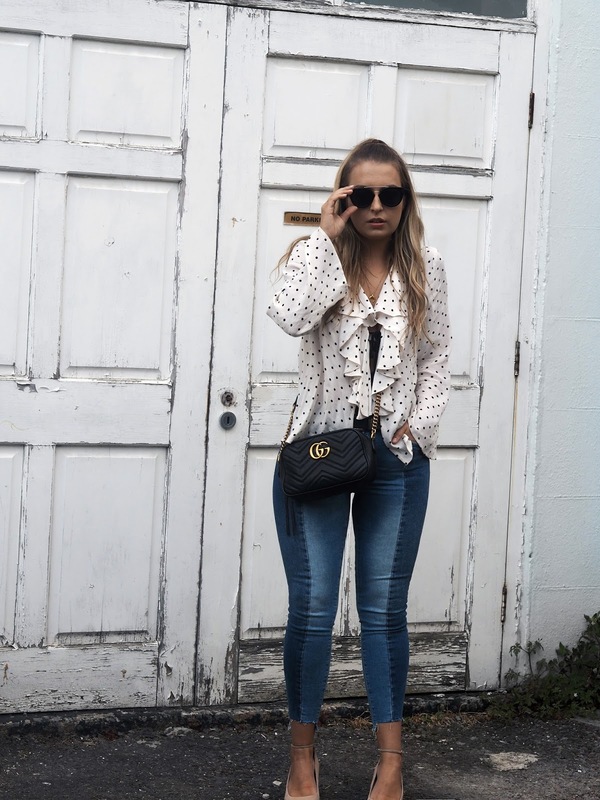 Thought I'd take a little break from my endless plethora of Bali content to share with you an outfit and some favourite new additions to my spring summer wardrobe. As much as I miss bikini life, I'm enjoying switching up some pretty new pieces as the weather slowlyyy starts to improve. One thing I do love about the UK is the summertime events and getting dressed up for them (and to sit and drink Pimms all day, no?). 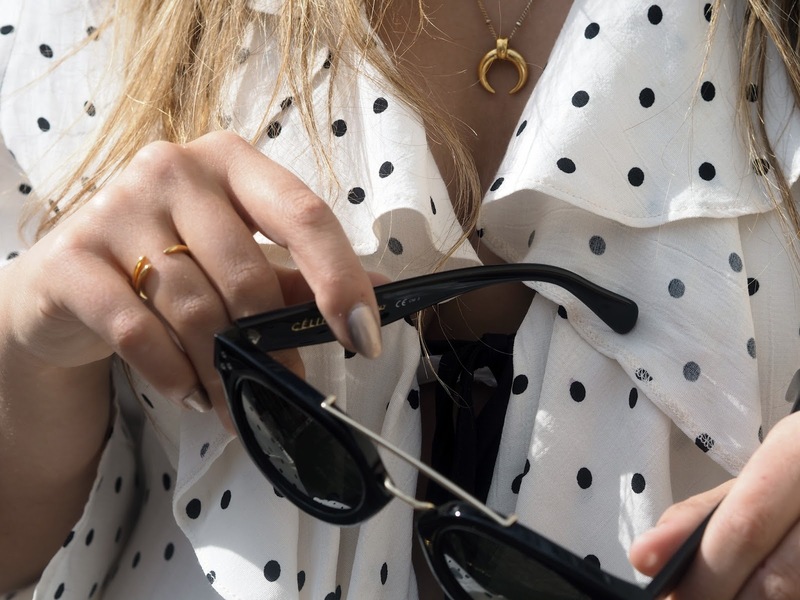 We're about to hit occasion wear season and that means plenty of excuses to treat yourself to summer blouses and dresses for weddings, races and barbeques galore. 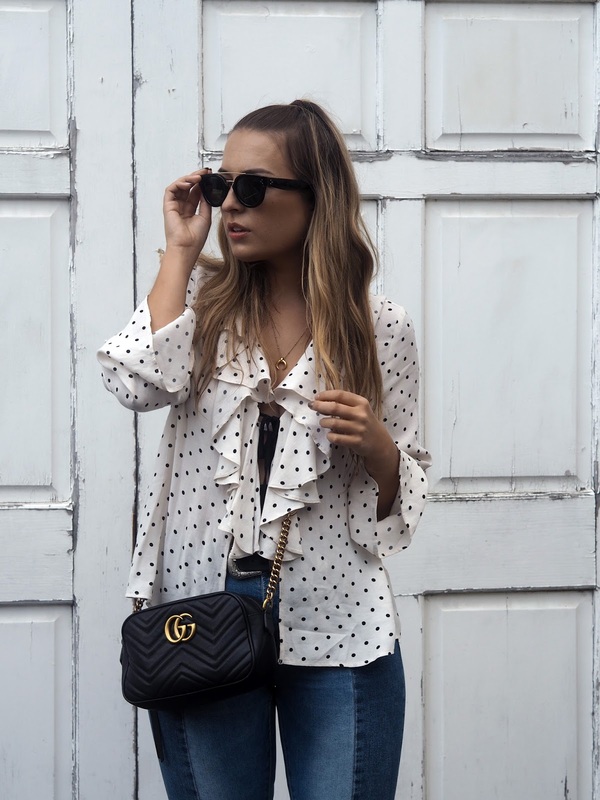 This flirty little ruffled number I picked up from Topshop and I'm obsessed. 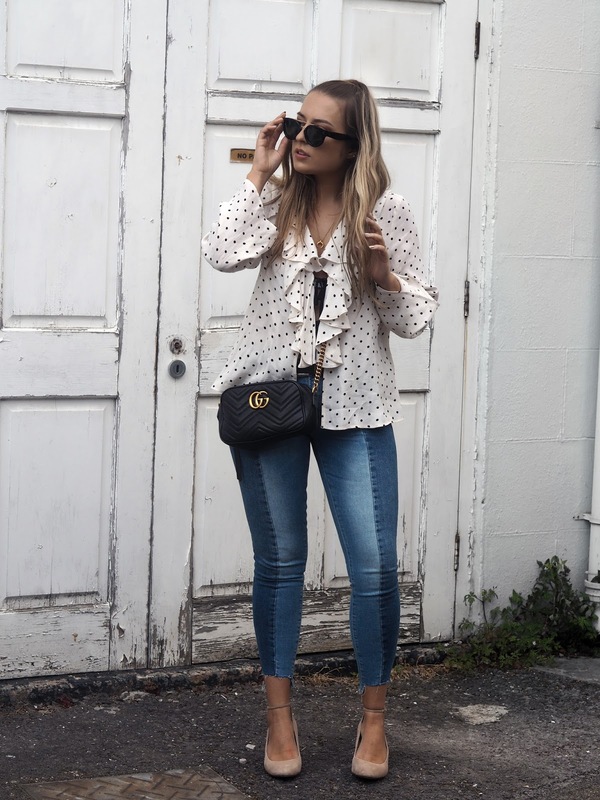 The tie front is super cute (if a tad revealing – like, be careful when it's windy) and the polka dot print makes it an easy throw-on piece to step up your trend game with any outfit. I love how it looks with these two-tone jeans here, but I think I'll be wearing it to ascot with a coral suit in a couple of weekends time too! It's sold out in some sizes, but I actually bought the petite in store and just sized up. And can we please take a minute to appreciate some very special new accessory additions. 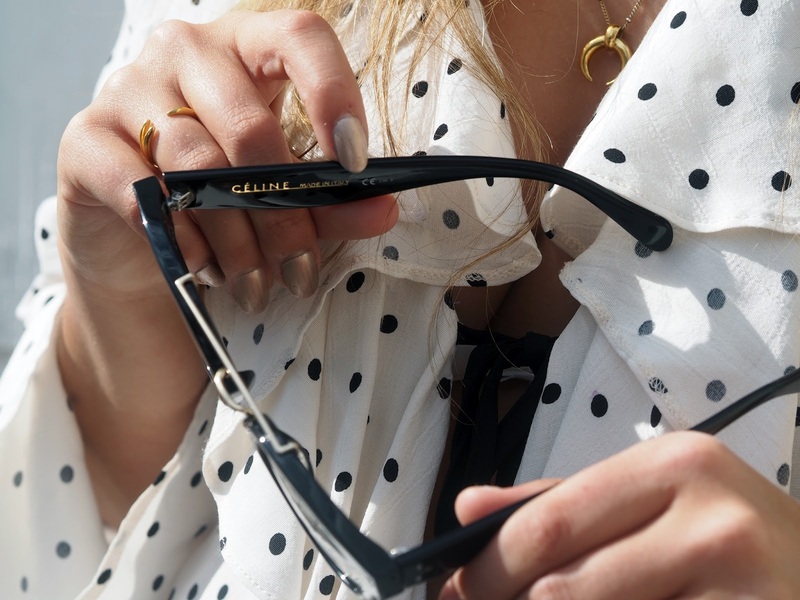 Thanks to Smartbuy Glasses I know own my very first pair of Céline sunnies and I. Am. In. Love. I have the 41043 style that features the signature three dots and bold frame, with a cut-out gold bridge in the middle. Classic, elegant and, ahem, perfect for hiding a multitude of sins from the bank holiday weekend (4 nights out in a row anyone? Just me? Oops). And I'm sure you've already seen her alllll over my insta (I can't help but sneak her into every single shot haha) but say hello to my new most prized possession the GG Marmont matelassé. I treated myself on the way out to Bali in the Gucci in Heathrow and it was definitely up there with special moments in my life! Is that sad? Haha. It was very exciting and the staff in the Heathrow T5 store were extremely lovely to me with it being my first Gucci purchase. It's so classic, goes with everything and I know I'll be getting ALL the wear out of it. And thanks to duty free, it was pretty bloody bargainous too. Speaking of Bali... If you haven't already seen my Instagram, I've made the extremely impulsive and spontaneous decision to fly back there. In less than two weeks. By myself. Yep, I fell in love with the place that much! So please shoot me a comment or DM if you'll be there too. Or if you have any tips for solo travel I would love to hear them below. But more on that trip in a future post – for now I still have plenty to share with you from my last trip, so stay tuned for that.